How to test which medication will work. Ear infections: What do the tests mean? 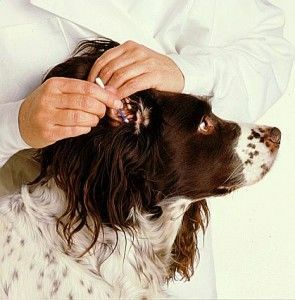 One of the most common reasons we see animals is for ear infections. The clinical signs are itchy, red and smelly ears. In fact, we are so used to seeing them we can often determine the cause of the infection just by the smell! 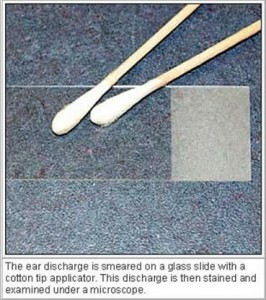 But when we stick a cotton bud into your pet’s ears and tell you we are checking which kind of infection they have, What are we really doing? We stain the slide and then look at it under the microscope to see which cells are in the discharge. Ear infections can be caused by bacteria, yeast or mites and each requires a different treatment. We recently saw a pug named Aristotle who had very smelly ears and this is what we saw under the microscope. All of the pink parts are inflammatory cells which are cells produced by Aristotle’s body to try and get rid of the infection. 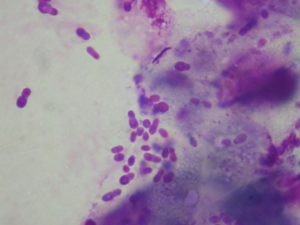 All of the tiny little purple lines are actually bacteria! If there was one type of antibiotic that killed all bacteria our lives would be much easier. Unfortunately this is not the case and this is why for some bacterial ear infections we send a swab to the pathologist to determine which antibiotic to use. We perform a similar test on urine in cases of urinary tract infections. The pathologist rubs the sample onto a special plate which allows the bacteria to grow on it. The pathologist can then test the growth to identify which bacteria are growing (in Aristotle’s case it was a bacteria called Pseudomonas aeruginosa). Once bacteria have grown on the plate, small discs of different antibiotics are added onto the bacteria. 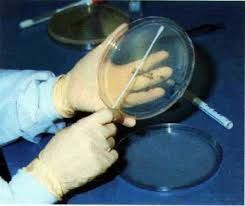 If the antibiotic is able to kill the bacteria, the bacteria around the antibiotic disc will disappear. If the specific antibiotic can’t kill the bacteria, it will not disappear around the disc. By performing this test we are able to determine which is the best antibiotic to treat your pet with to kill their infection. Aristotle was given some ear drops and his ear infection was gone in 10 days! Ear infections are very common in our pets and can cause them to be itchy and very uncomfortable. If your pet has is shaking their head, scratching or has red, smelly ears please bring them to VetHQ for a consultation. Here is a picture of a different dog that had a yeast infection. All of the little snowman shaped purple blobs are actually yeast! This dog will need a different treatment to Aristotle whose ears were filled with bacteria rather than yeast. We stain the slide and then look at it under the microscope to see which cells are in the discharge. The pathologist rubs the sample onto a special plate which allows the bacteria to grow on it. By performing this test we are able to determine which is the best antibiotic to treat your pet with to kill their infection.